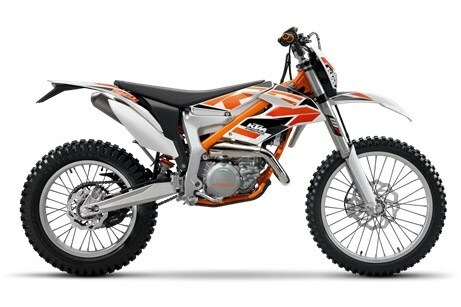 To power the FREERIDE 250 R, the KTM design engineers took the two-stroke engine from the 250 EXC competition enduro and subjected it to comprehensive refinements, thereby reducing the weight of the already particularly lightweight power unit - in spite of electric starter - by a whole two kilograms and tuning it for optimal rideability. The engine on the FREERIDE 250 R is equipped with its own cylinder, featuring ducts and valve timing adapted to the desired torque curve, as well as a matching piston. Similarly to trials motorcycles, the elaborate exhaust control system of the 250 EXC has been omitted, which not only has a beneficial effect on the torque curve but also on the durability of the piston. That makes this engine even less complicated and even more robust. Both the FREERIDE 250 R and the FREERIDE 350 are equipped with an undamped CCS (coil spring steel) clutch, featuring a wear-free steel cage and a clutch package tuned especially for the FREERIDES with seven steel carrier lining discs. Not least thanks to the special friction linings and softer springs, this clutch is characterised by optimized disengagement, while the hydraulic clutch armature from Formula ensures that the clutch is always easily and precisely controlled. A quicker gear reduction between the electric starter and the engine ensures a higher engine starting speed and hence, in conjunction with the lithium-ion battery, significantly higher starting reliability. Compared with the 250 EXC, the 6-speed gearbox specially developed for the FREERIDE models has shorter transmission ratios, while the extended sixth gear is effectively designed as an overdrive. A short secondary gear ratio of 46 to 12 (FREERIDE 350 12/48) guarantees powerful traction and lively acceleration, especially in demanding terrain. Waste heat from the engine is dissipated via a single-piece, protected, integrated radiator. A fan fitted as standard together with the thermoswitch, guarantees stable temperature management, even at a slower pace in tough terrain. The FREERIDE 250 R is equipped with a specially developed, low-noise exhaust system, featuring a light-alloy silencer and a slender soundbox, that contributes to the high-torque engine characteristics. In contrast to the header laid under the engine on the FREERIDE 350, KTM design engineers succeeded in locating the header on the FREERIDE 250 R to one side and integrating it optimally into the bike. Similarly to the sports enduros, the two-stroke FREERIDE is homologated with a special power reduction and can even be approved for use on public roads in this version.